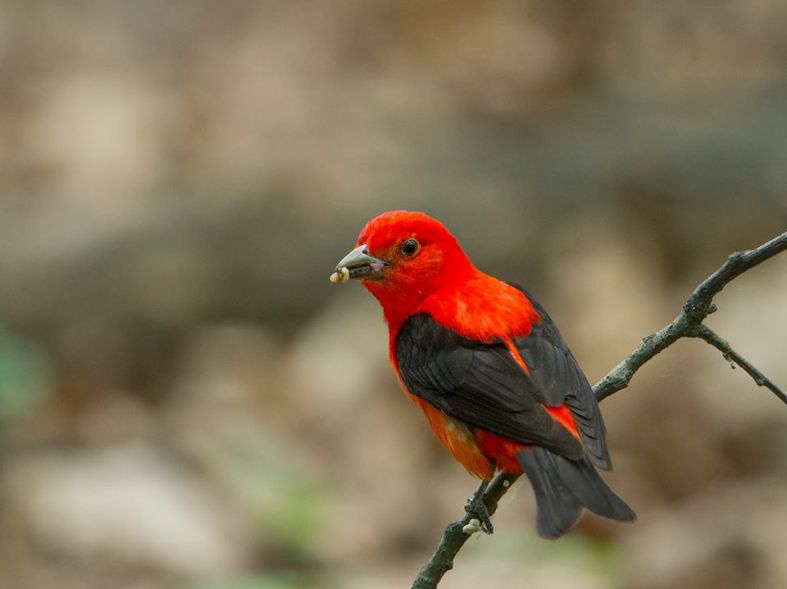 Where did this Scarlet Tanager spend the winter? A birder might correctly say “South America,” but where specifically? How can we know the country, the province, the latitude and longitude? In fact, chemical signatures in feathers, blood, and muscle tissue tell the story of where a bird has been, and what it’s been eating. Over the past couple of decades, ornithologists and chemists have learned how to read into birds’ life histories by analyzing the isotopes that have built up in its body. An isotope is just a lighter or heavier-than-normal atom of a given element (like hydrogen, carbon, or nitrogen). Two kinds of particles contribute to an atom’s mass: protons and neutrons. Most atoms of any element have the same mass because they share the same number of protons and neutrons. While the number of protons in an atom define its identity and properties, adding a neutron to an atom rarely changes its behavior (other than its mass). For example, a bird will suffer no ill effects if a bird’s body contains an abnormal ratio of carbon 13 to carbon 12 (that is, “normal” carbon versus heaviercarbon with an extra neutron). Like any living beings, birds incorporate nutrients from their food into their bodies as they grow. The atoms in these nutrients, some of which will end up in a growing bird’s flesh and blood, exist in different isotopes depending on a variety of factors. Some isotopes are more common at certain latitudes, or in certain groups of plants, or at a certain level of the food chain. So, a bird’s body will contain different proportions isotopes depending on its location and diet. By analyzing the ratio of one isotope to another in a bird’s body, scientists get an idea of where individual bird is from and what it’s been eating. Isotopes are particularly useful in long-term or large-scale studies. Isotope analysis ismuch cheaper and often less invasive than attaching geolocators to migratory birds, many of which are too small to carry a transmitter (meaning someone must recapture the bird to recover tracking data). Studying isotope ratios in natural history museum specimens also provides unique historical perspective on how birds’ diets or ranges have changed over time. In the next post, we’ll go over a few studies that have used isotopes to track long-term changes in bird diet or established where populations of breeding birds overwinter. Stay tuned! This entry was posted in Research and Monitoring and tagged american redstart, bird chemical analysis, bird diet, Birds And Isotopes, golden-winged warbler, Isotope Studies, Isotopes, tracking migratory birds, whip-poor-will on June 14, 2018 by William Freedberg.